Herbert Stepic offers his resignation as CEO of RBI. Herbert Stepic has informed the Chairman of the RBI Supervisory Board, Walter Rothensteiner, that he is offering to resign his position as CEO of Raiffeisen Bank International AG due to personal reasons. The responsible committees at RBI will promptly consider this proposal. 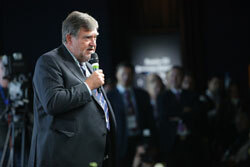 Herbert Stepic will continue in his function of CEO until the committees reach a final decision.